The Birth 14 октября 2002 г. The Escape 21 октября 2002 г. The Flashy Assassin 28 октября 2002 г. The Result of the Duel 4 ноября 2002 г. Tears of Iron 11 ноября 2002 г. Looking for the Missing Doctor 18 ноября 2002 г. Attack the Invisible Opponent 25 ноября 2002 г. Friends, the Matter About 2 декабря 2002 г. The Devil in Deep Sea 9 декабря 2002 г.
Polarization War 16 декабря 2002 г.
Holy Night Image 23 декабря 2002 г. The Secret Unmanned Island 6 января 2002 г.
Fog of London 13 января 2002 г. Meeting Again 20 января 2002 г.
Goodbye, My Friend 27 января 2002 г. Invasion 3 февраля 2002 г. Final Fight 10 февраля 2002 г. The Story of a Striving Restaurant 17 февраля 2002 г. 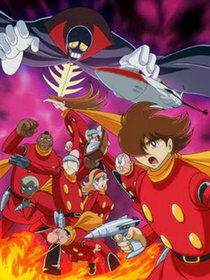 The Heroes Qualification 10 марта 2002 г.
Visional Dog 3 марта 2002 г. The Evil Fossil 24 февраля 2002 г.
Mites Book 1: God's Raid 17 марта 2002 г. The Standing Myth 24 марта 2002 г.
Artemis 31 марта 2002 г.
Mythos, the Final Chapter 7 апреля 2002 г.
Gilmore's Notebook 21 апреля 2002 г. Little Visitors 28 апреля 2002 г. The Awakening 5 мая 2002 г. The Blue Earth 12 мая 2002 г.
Computoia 19 мая 2002 г.
Monster Island 26 мая 2002 г. Man or Machine? 2 июня 2002 г. Frozen Time 9 июня 2002 г. The Pharaoh's Curse 16 июня 2002 г. The City of Wind 23 июня 2002 г. The Frozen Land 30 июня 2002 г. The Night of the Star Festival 7 июля 2002 г. Black Ghost Lives 14 июля 2002 г. The New Assassins 21 июля 2002 г.
Gamo's Revenge 28 июля 2002 г. Future Fury 4 августа 2002 г. To Tomorrow 11 августа 2002 г. Old Friends 18 августа 2002 г. Nightmare of Van Bogoot 25 августа 2000 г.
Good-Bye, My Dolphin 1 сентября 2000 г. The Underground Empire 8 сентября 2000 г. Underground Empire Yomi ed. Special Ed. Hades landscape 22 сентября 2000 г. When You Wish Upon a Shooting Star 29 сентября 2000 г. The Goddess Scheme 6 октября 2000 г. The Fluttering Australia 13 октября 2000 г.